Hello, what does the fst with 69 mb for wikipedia contains ? Only the titles of the entries or the whole text as well ? That FST held all unique terms (tokens) from indexing all English Wikipedia content. As the FST has a high CPU because of seeking, how bad are its performances affected by multiplying the number of existing terms? Do you have an estimation of how is a typical query time distributed between the FST, seek in the term dictionary, calculating frequency or positions? How can I profile that in my own index? The FST seek time is typically a tiny part of the overall query execution time; usually most of the time is spent iterating through the postings once the lookup is done in the terms dict. Only terms-dict heavy queries (e.g. FuzzyQuery, DirectSpellChecker, WildcardQuery) will really stress the terms dictionary. That said, we have a Google Summer of Code project now working on using an FST to hold all terms in the terms dict, which then relies much more on the FST performance ... https://issues.apache.org/jira/browse/LUCENE-3069 has the details. it seems that the result of the Google Summer of Code project has been committed. Having a FST holding the complete Term Dictionary I think could be useful, for example in the SpellCheck scenario, to make a quick intersection between the Levenstein Automaton and the Index Terms Dictionary . Unfortunately, I believe the FuzzyQuery performance was slower with the new FST-based terms dictionary, but yes, that is the idea: it ought to be faster. DirectPostingsFormat, which stores all terms AND postings in RAM, does give a good speedup for fuzzy queries, so a DirectSpellChecker implemented on that would be faster. However, this format is VERY RAM consuming, i.e. it makes no effort to "compress" things (unlike FST). I think there is room for a happy medium, e.g. pull out the terms dict from DirectPostingsFormat, maybe compress it a bit (but not as much as FST), and I think we'd see good speedups for terms-dict intensive operations. We may even want to implement the Levenshtein intersection without the intermediate automaton, i.e. "on the fly", because constructing that automaton takes non-trivial time. For the intermediate automaton are you referring to the Levenstein Automaton, accepting all the strings with the expected distance from the query term ? So directly building an automaton, accepting only Index terms with the expected distance from the the query term ? But is it feasible ? but one thing I remember is that Lucene FST implementation is so good and compact because it creates an immutable FST ( that becomes a sort of byte array under the hood) . So creating an expandable FST is already possible or it will be a challenge ? But note that the Levenshtein automaton that we build/intersect for FuzzyQuery is not an FST; it's an Automaton (Lucene has two separate packages for these). I suspect by not pre-building the automaton, but rather expanding it on the fly, we could see some speedups in certain cases; not sure how much. Are we using fst to make inverted index? If yes, where the output of traversing a string in fst pointing to? FSTs are used only in certain places, e.g. the terms index (held in RAM, mapping term prefixes to blocks on disk), dictionaries (hunspell), suggesters, synonyms, etc. They are also used in an optional MemoryPostingsFormat, where each term and its postings are held in a big FST (good for primary key fields). We also more recently added a terms dict that holds just the terms + pointers to on-disk postings, in an FST. What the output contains / where it points to varies drastically with each of these uses... really it's generic and can be whatever you need it to be. bake that in some fst`s like wordFST scoringFST and so on. is this approach will benefit over traditional, and as i red there is no incremental way of updateing a fst i has to be rebuild from ground up. Yes, you can encode that into an FST, and e.g. Lucene's MemoryPostingsFormat does exactly that. But this is not a good fit for fields where each term may occur in many docs, because the output byte in that case can get quite large. i see thanks. 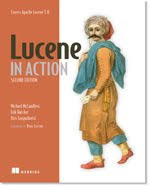 I am almost sure you have seen the talk Michael Butch(sorry if i misspelled his name) gave about their implementation of memory postings in lucene and recent improvments that can lead them to be merged back in lucene, wondering is there initial talk about that. I was wondering whether it is possible to associate ids with recognized strings in the automata. Say for instance I have a lexicon and each of its entry has a unique integer id. I'd like to compile the lexicon as an union string automata and whenever it recognizes an entry in a string, it outputs the unique id. It's like using the automata as a set of primary keys. I could not find such an example of use online. Associating a String to an arbitrary (including Integer) output is precisely what FSTs are for, so that use case works easily. Try looking at TestFSTs.java for an example? I have a question regarding prefix queries. How expensive it is to do prefix queries. We are using solr in our organization. Majority of our queries are becoming prefix queries and i am worried that it will effect the performance. since it is not searching at that point but more of a matching. what do you suggest if majority of the queries are prefix then should these be handled on index time using something like EdgeNgram instead doing all this at query time. Just to give you an idea , our index might have 500 million terms. 1) "As you traverse the arcs, you sum up the outputs, so stop hits 3 on the s and 1 on the o, so its output ordinal is 4." For a given word (in your discussion, the word "stop"), are the output values assigned to arbitrary transition ("arcs")? Could you have instead assign: "stop hits 3 on the t and 1 on the o, so its output ordinal is 4."? 2) From the start state, why do transitions "p/2" and "t/5" going to the same state? 3) For simplicity, let's ignore stemming for a sec, and suppose we index a new word "popstar", do we simply introduce an arc going from end state back to the state which "s/3" points to? After giving it more thoughts, 3)is not correct. Perhaps I'll just ask, what would your FST would look like if we indexed popstar? Is it possible that the FST takes regular expressions so that any sequence matching one regular expression can be transformed to an output. Could you please give me a few pointers please. Thank you!